It’s a rainy Thursday night, and as locals check in at Laguna Beach’s new Ocean at Main, the chatter swells as neighbors share their shock and awe. “Costa Mesa is flooded,” says a waitress. “I heard cars are abandoned in Corona del Mar,” reports a man stashing his trench coat. The room exudes an intimate conviviality that outsiders associate with Lagunatics. 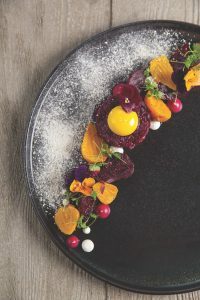 Open since October, this venue is the eagerly awaited breakaway project of Craig Strong, the longtime executive chef at Studio, Montage Laguna Beach. Awash in aqua hues and earthy textures, the seaside-chic 80-seat room complements downtown’s more typical backdrop of sunshine and sea breezes, even on a night of downpour. 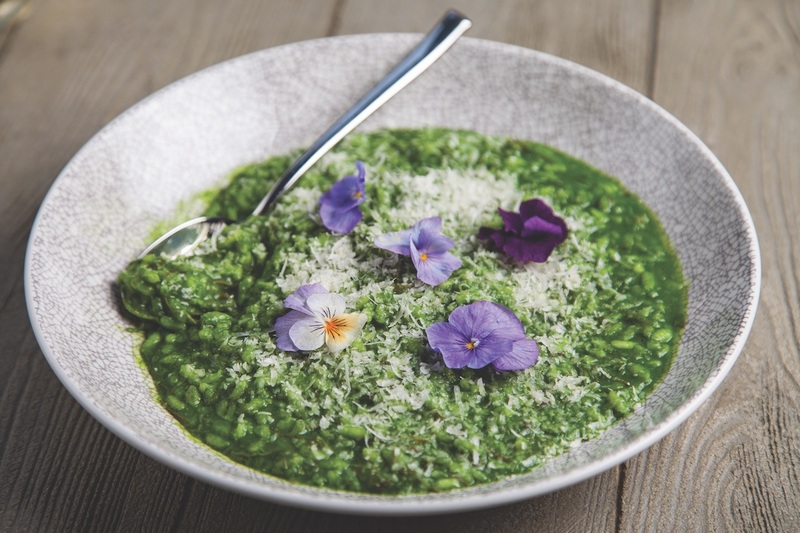 After a decade amassing accolades for Studio, and before that, nabbing a Michelin star for posh Langham in Pasadena, Strong is fervently committed to weaving Ocean at Main into the funky fabric of Laguna Beach. 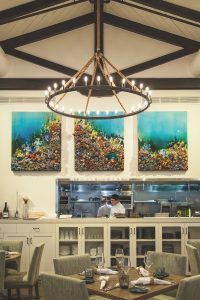 The stunning wavescape stretching over the open kitchen is by local artists JoJo Bros. Designer Laurie Alter, founder of neighboring Tuvalu Home, preserves and renews the 1940s charm of the building’s original owner, Laguna Federal Savings and Loan. Strong was smart to open well after summer’s tide of tourists because it allowed time to woo his local fan base and fine-tune his eager crew and cuisine before the next blitz of visitors. No matter whether a restaurant labels them starters, appetizers, snacks, or first courses, I confess they’re my soft spot. Maybe it’s my overeager palate, but those early dishes are often a menu’s high point, and when they fall short, it’s a tough impression to reverse. So what a relief that several here are dazzling, starting with the Hawaiian prawn potato soup with lushly sweet shrimp in an emerald-green basil broth made hefty with lemony potato pearls and dotted with flower petals. Pristine Kusshi oysters on a bed of crushed ice are so mild and delicate they earn the name—kusshi is Japanese for “ultimate.” They satisfy without their rosé-green apple granita garnish, but for those who resist briny nakedness, the tart slush supplies some sartorial propriety. Amply portioned Dungeness crab with ridged cavatelli disappears too quickly thanks to the evanescent lightness of the snow-white crab, dainty pasta, and notes of preserved lemon and just-snipped chervil. Charred Spanish octopus with cauliflower, bicolor amaranth leaves, and dots of parsley sauce is dramatically plated on a slate-gray disc but is more memorable as a presentation than a taste sensation. Lunch is where you’ll find sandwiches that include green curry chicken breast that, alas, is over-bready and a bit bland. I regret not having the Catalan tartine with fresh tomato-rubbed bread layered with salty Serrano ham and topped with Manchego cheese-arugula salad. Though the day’s pizza special is loaded with a flurry of white truffle shavings, the $100 price is a deterrent. Instead, we share a ho-hum margherita pizza. Memo to self: Pizza is ubiquitous, white truffles are scarce. But the fetching 40-seat courtyard patio is sunny and heated and perfect for people-watching and chatting while sipping rosé. The award for best dinner appetizer goes, without contest, to oxtail kale risotto imbued with Parmigiano-Reggiano. I’d never heard of such a dish, and I’ll never forget its soulful flavors of creamy rice with a Kelly-green hue and the hyper-savory shreds of luscious braised beef. Having learned my lesson at lunch, I opt for the $30 upgrade of 2.25 grams of white truffle with the risotto—princely peasant food indeed. Spiced Morro Bay cod is a refreshing follow-up to the rich risotto. Deftly cooked cod bursts with ocean flavor while curls of fried calamari contribute crunchy complexity, all united by a chorizo-amped clam broth. Beef tenderloin arrives roasted to a perfect medium-rare; the accompanying maitake mushrooms are umami-rich but not quite enough to tip the dish into memorable territory. Note to dessert fans: Leave room. Outside of resorts, pastry chefs are a dwindling luxury, and Keara Wilson is one of Ocean at Main’s alluring assets. Chocoholics are sure to fall hard for her dark, crumbly torte matched with a fat ribbon of piped cardamom-tinged ganache and mellow bourbon ice cream. It’s not overly sweet, so the Dominican Republic chocolate shines through. Warm apple crisp stars intense fruit—which isn’t drowning in syrup—under a roof of lemony pecan streusel that pairs splendidly with salted caramel ice cream. Weekend brunch service is so new that it missed this deadline, but Strong reports that the menu includes chilaquiles made with his secret salsa fuerte. I’ll be back for those some sunny day on the patio. Another fun fact about brunch: Strong’s 6-year-old daughter, Scarlet, is the inspiration for the five-spice pancakes. Ocean at Main is Strong’s deep dive into his tight-knit community. The Laguna Beach resident is no longer tied to Montage, but he’s not going anywhere. How nice that we can enjoy the coastal fare he likens to what he serves family and friends at home. Clearly, his new second home is on Ocean Avenue. FYI: Your tab’s kitchen tip is for the team that never visits your table.